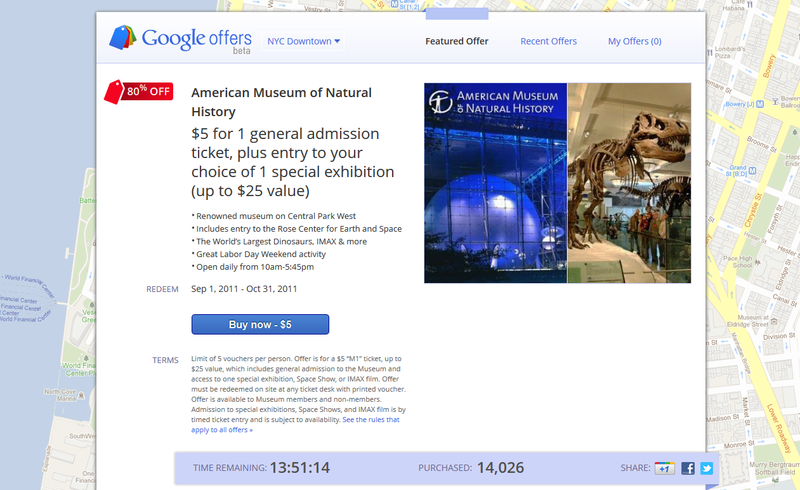 Earlier this week, Google launched a daily deals offer on its homepage. The company has been experimenting with daily deals coupons in major U.S. cities for some time now and certainly made it an official pert of their search engine on Wednesday when it went live on Google.com. The deals market has been a challenging one to enter, as reports indicated the industry lost 28 players last month, keeping Groupon and Living Social. Yipit, a research firm reported that 60% of internet users and consumers feel as though the daily deals market is overcrowded and too confusing to navigate. Facebook withdrew their “Facebook Deals” last month. True as these facts may be, Google did generate 96% of its revenue last year from advertising that appear alongside their search results. The ultimate advertising board. With the news of Google now entering the market by placing daily deals on their homepage, users may feel confident that this is one major player that will be sticking around for a while!